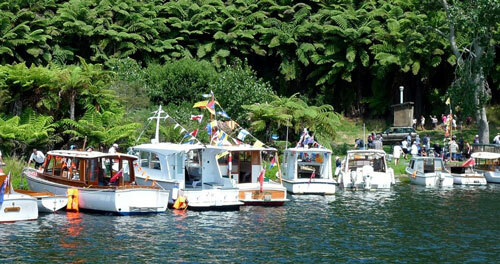 A parade of classic and wooden boats on Lake Rotoiti, Waitangi Weekend, Feb. 8–9. Entry to this parade is limited to classic or wooden boats only. All other events are open to any type or age of boat. Please contact us if you are unsure of your eligibility. REGISTER NOW. The best viewing location for spectators wishing to enjoy the parade from dry land is the reserve on State Highway 33 adjacent to number 694, just south of the Okere Falls Store. The water opposite this reserve is where the boats begin to gather at 10 a.m. ready to parade past the reserve at 10.30 a.m. and loud speakers will be set up so you can enjoy the commentary and history of the boats.